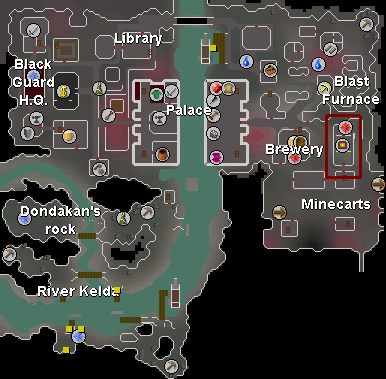 The Keldagrim Blast Furnace is a member's only Smithing related Activity that requires half the amount of coal to smelt your metal bars. Unlike other Activities, this one has the option of being done alone with the met requirements of course. 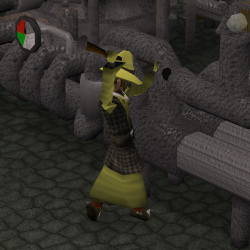 To complete each task in operating the furnace, you need at least level 30 in the following skills: Agility, Firemaking, Strength, and Crafting. This Activity is well worth the time for the experienced smither! The Keldagrim Blast Furnace is located within the Dwarven City of Keldagrim, which is accessible after the completion of the Giant Dwarf Quest. The furnace itself is located underground, with the entrance near the south-east corner of the city, denoted by both an Activity and furnace symbol on the minimap. 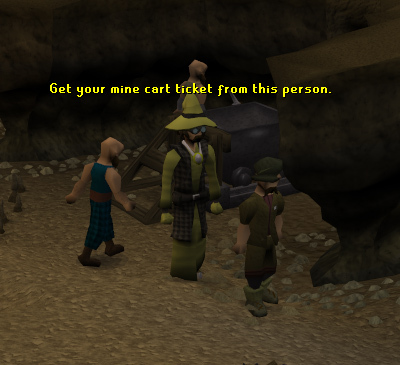 The most popular method to reaching Keldagrim is the mine carts, located near Nurmof's pickaxe shop in the Dwarven Mines. However, a fee of 150 gold pieces is required along with the requirement of having visited the city once before. With a Ring of Charos(a) the fee is reduced to 75 gold pieces. Keldagrim can also be reached via the mining carts under the White Wolf Mountain for 100 gold pieces, or 50 gold pieces with a Ring of Charos(a) respectively. A more unpopular means of transportation to Keldagrim includes the Fairy Rings with the code "DKS". After heading inside the tunnel, the the entrance is off to the east. Afterwards, take a boat ride to northern Keldagrim by talking to the Boat Ferryman for no charge. If forced to, you can just walk to Keldagrim. The entrance to Keldagrim is located east of Rellekka. Lastly, there is another way to reach Keldagrim via the Train located in Dorgesh-Kaan. This method requires that the Another Slice of H.A.M. Quest be completed. To transport to Keldagrim, simply enter the Train Station in the southern area of Dorgesh-Kaan and wait about thirty seconds to one minute. The train will depart and after a short cut-scene and you will appear at the Keldagrim Train Station. Here is a diagram showing all of the operational parts of the blast furnace with a brief description on each. The conveyor belt in which to deposit your ores onto. A possible malfunction as a result of operating the bike; needs to be repaired with a hammer and 30 Crafting is required. When operating the bike, the cogs can tend to jam; needs to be repaired with a hammer and 30 Crafting is required. The bicycle that peddles the ores on the conveyor belt into the furnace. The stove that keeps the furnace warm and operable. A stash of coke (coal) is kept next to the stove, along with a spade to use to transport the coke into the stove. The color of the grates of the stove represent how full the stove is. The pump to feed the heat of the stove into the furnace. A weak spot in the pipeline that tends to break from time to time. This will stop the process of heat being pumped into the furnace and stop all smelting activity. Requires 30 Crafting to repair along with a hammer. The temperature gauge that informs players on when there are breaks and when the stove needs to be fueled when being monitored. Has no requirements to operate. Another weak spot in the pipelines of the Blast Furnace. Requires 30 Crafting and a hammer to repair. The bar dispenser that spits out hot smelted bars. When empty, a player can look at this to determine the amount of coal in the furnace or the amount that is required to smelt the ores already inside of the furnace. Use a bucket of water on the piping hot bars, enabling you to retrieve them. A Smithing level of at least 60 is advised, but not required. 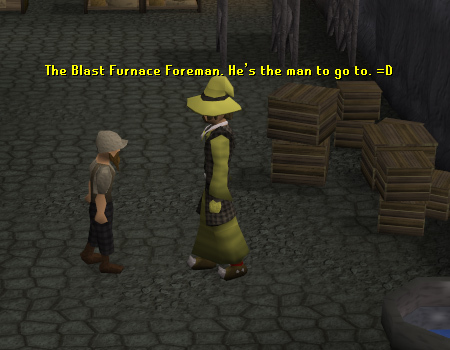 However, the Blast Furnace Foreman will charge you 2,500 gold pieces every 10 minutes of using the furnace if you don't possess 60 Smithing. If you possess a Ring of Charos(a), you will notice you will only have to pay 1,250 gold pieces instead. Operating the bike causes the conveyor belt to move, which deposits ores into the furnace to get the smelting process started. An Agility level of 30 is required and you receive 1 experience per peddle. Be cautious as the cogs or the drive belt on the conveyor may break. You must also have run energy to operate the furnace, as it is consumed while taking part. Often times you will find yourself with low energy while performing this task. To restore it, take energy potions with you or make use of the Spirit Terrorbird familiar that has a scroll ability called Tireless Run that restores your run energy based on your Agility level. You can also use the Salt Water Spring in Oo'glog to give yourself infinite run energy for about 25 minutes. Making sure that the furnace is filled with heat is essential in the smelting process. To do so, you must fill your spade with coke and deposit it into the stove. A Firemaking level of 30 is required to shovel coke into the stove. You get 5 experience per shovel of coke deposited into the stove. There are no dangers of this operation. To get the furnace hot, the heated air must be pushed through pipes into the furnace chamber. There is a pump near the south-east end of the furnace in which to push hot air into the furnace. A Strength level of 30 is requires and you get 2 experience per pump. Listening to the bars coming out through the dispenser or an available ally at the temperature gauge will let you know when to stop. If pumped too much, the heat will backfire and cause considerable damage. Often times parts of the furnace will break, resulting in a halt of the smelting process. A simple patch-job with a hammer is all these fixes need along with a requirement of 30 Crafting. You get 50 Crafting experience per fix. It is worth noting that these breaks can be fixed with a Sacred Clay Hammer for 100 experience per fix and it does reduce the charge of the hammer. 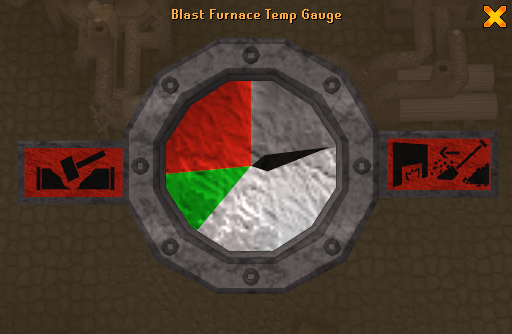 Although not a requirement, a player can monitor the temperature gauge for the other fellow players operating the furnace. This gauge informs the player about when the stove needs to be refueled, when a break occurs, and when to tell the pumper when to stop pumping. When the needle on the gauge goes into the red zone, it is a good idea to shout "Stop!" or "Red!" to the pumper. There are several NPCs that roam about the area of the Blast Furnace that will prove to be of valuable use to any player. It is important to understand that the shop prices are dependent upon the Grand Exchange prices and the stock of the ores. To get a general idea on current shop prices, please see the Item Database. Jorzik is the armor salesman within the Blast Furnace. He is a player-fed salesman, meaning his initial stock of items is at zero and buys armors from mithril to rune. The only purpose of this salesman is to quickly sell smithed items. For first time users, the Blast Furnace Foreman explains in detail how to use the Blast Furnace. For people below level 60 Smithing, you have to pay him 2,500 gold pieces for every 10 minutes of using the furnace or 1,250 gold pieces with a Ring of Charos(a). 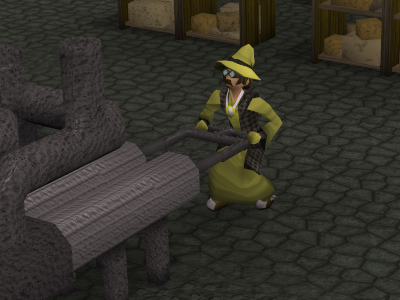 The Blast Furnace Foreman also sells the Blast Fusion Hammer for one million gold pieces, which is required to piece together the Dragon Platebody at the Dragon Forge. The Dragon Forge can only be accessed after completion of the While Guthix Sleeps Quest. There are many places of interest inside of the Blast Furnace area to both supply your needs for operating its functions and to make use of your smelted bars. 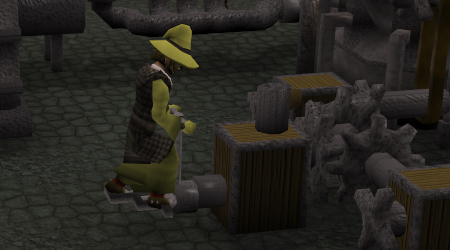 The anvils require 60 Smithing to access. Here, you can smith your smelted bars and either sell the smithed items to Jorzik or keep them for yourself. Located in the north-west corner of the room. This is where you retrieve your bars and also to monitor the amount of coal in the furnace or the amount of coal you need to add into the furnace. Located to the western portion of the room. The place to grab a bucket, fill it up with some fresh water and cool off the blazing hot bars in the Dispenser for retrieval. Located along the southern wall in the room. When you've forgot your hammer for whatever reason, there is always one here! Located around the north-eastern corner of the room. Here in this section some of the most common methods of using the Blast Furnace will be covered. Please note that all of these methods require 60 Smithing or higher to use. 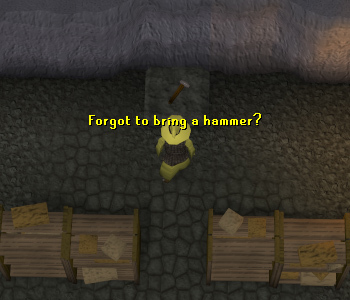 If you are using Sacred Clay Hammers for smithing your bars, you can take two tools with you for one inventory space. This can be done by having a Sacred Clay Hammer and a Proto-Tool and morphing the Proto-Tool into a wieldable item. When your first hammer crumbles to dust from smithing, unequip the wieldable tool and re-morph it into a hammer. 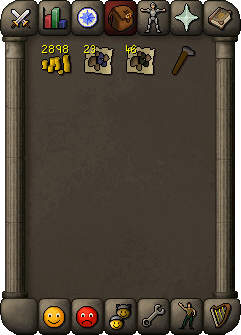 This can be done to save some banking time by a good measure and enjoy your smithing for longer periods. Each Sacred Clay Hammer gives close to 32,000 extra experience in Smithing. So after gaining roughly around 64,000 experience in Smithing while using a Sacred Clay Hammer, the hammer will have crumbled to dust. Sacred Clay Hammers are obtained from the Stealing Creation Activity. Since un-noting 46 coal costs 1035 gold pieces and un-noting 23 mithril ore costs 1863 gold pieces, the total amount equals 2898 gold pieces. Depending on the amount of ores you want to bring will affect the amount of gold pieces you will need to bring. 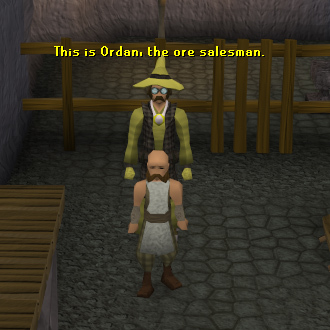 When at the Blast Furnace, select your noted coal and use it on Ordan. When asked how many to un-note, select "X". After that, enter the number 23 and accept the cost. Now drop the coal onto the conveyor belt and repeat this process 7 more times. You should now have 192 coal heading into the furnace. Un-note 23 mithril and drop it onto the conveyor belt. 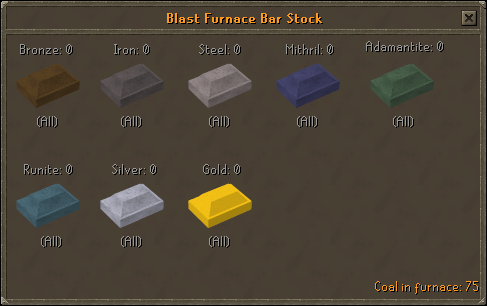 If there are a lot of people working on the furnace (usually at world 58), then un-note 23 more mithril ore as the other ores you put on the conveyor belt head into the furnace. 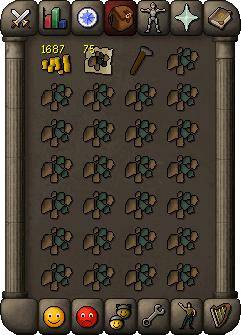 Only deposit the next 23 mithril ore when the first batch has already appeared in the bar dispenser. 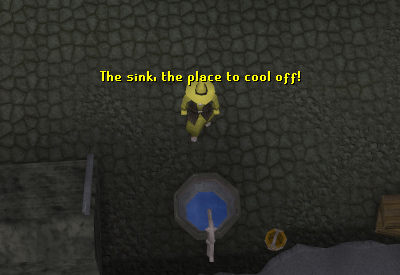 Cool your bars off with a bucket of water from the sink and proceed to smith your mithril bars at the anvils. Also, when on a world with many workers, by the time you are finished turning all of your mithril bars into bolts the next batch should have already spit out. Don't smith those bars just yet, deposit another 23 mithril ore onto the conveyor belt first, then proceed smithing the next batch. If you find yourself waiting around on a populated server, you can deposit more coal onto the conveyor so you are never wasting time, but make sure you don't exceed 200 coal, or you will be stuck with coal in your inventory. Repeat this process until all of your materials are exhausted or want to stop. When you get decimal numbers in the cost to un-note ores or coal, the final number is rounded down. Since 75 coal costs 1687.5 gold pieces to un-note, the cost is rounded down to simply 1687 gold pieces. When at the Blast Furnace, first thing you do is free up your inventory by depositing the adamantite ore onto the conveyor belt. Next, select your noted coal and use it on Ordan and proceed to select 25 coal with option "X". Drop the coal onto the conveyor belt and repeat the process of un-noting coal 5 more times. You should now have 150 coal heading into the furnace. Grab a bucket and fill it with water while you are waiting. 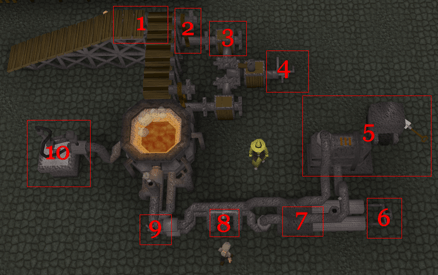 If you find yourself standing around waiting, go help others with the tasks of operating the Blast Furnace. When the bars deposit out of the dispenser, cool them off and proceed to make 5 adamant platebodies. After that, head to the bank in Keldagrim and head back to the Blast Furnace to repeat the process. If you have 96 Summoning, you can use a Pack Yak to literally complete two runs in one trip with its 30 extra inventory slots. When finished with making all of your bars into platebodies, you can use high alchemy on them and reap the rewards.